George Willem Opdenhoff was born in Fulda (Germany) in 1807, he died in The Hague in 1873. He was a pupil of the landscape painter A. Schelfhout and J.C. Schotel who painted seascapes. He lived and worked in Breda from 1835 to 1837. 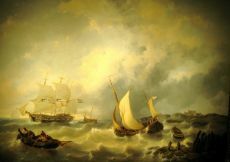 After traveling to the French coast in 1837, he settled in Rotterdam between 1837 and 1842. About 1842 he moved to The Hague. He painted seascapes, beach scenes and... Read moreGeorge Willem Opdenhoff was born in Fulda (Germany) in 1807, he died in The Hague in 1873. He was a pupil of the landscape painter A. Schelfhout and J.C. Schotel who painted seascapes. He lived and worked in Breda from 1835 to 1837. 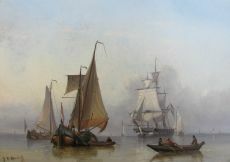 After traveling to the French coast in 1837, he settled in Rotterdam between 1837 and 1842. About 1842 he moved to The Hague. He painted seascapes, beach scenes and riverscapes. He exhibited in The Hague between 1835 and 1867 and Rotterdam in 1873. His work is included in Gemeentemuseum Den Haag.